Tenkara, simple fly fishing method from Japan, uses only a telescopic tenkara rod, tenkara line and tenkara fly: What’s a tenkara rod? Consider this a public service announcement. Since we introduced tenkara outside of Japan in 2009, a number of rods have appeared in the market, being offered as tenkara rods, and a number of people with passing knowledge of the method have jumped on the bandwagon to offer their “alternative” to tenkara. This has translated into every kind of telescopic rod being marketed as a “tenkara-style rod”, whether it is designed for tenkara or not. This greatly concerns me. There is a reason there are rods specifically made for tenkara. There is a reason I design rods for tenkara and rely on feedback from tenkara teachers in Japan for making our rods the best possible tools for tenkara. And there is a reason you can visit any tackle shop in Japan, or open the pages of the larger Japanese fishing magazines, and find tenkara rods next to cheaper telecopic hera rods (for carp), telescopic keiryu rods (for stream bait-fishing, generally trout), and telescopic tanago rods (for “micro-fishing”); yet just like a fly-fisherman in the US wouldn’t use a spinning for for fly-fishing, no tenkara angler would use the other rods for tenkara. In sum, there are reasons the rods look different and are marketed for entirely different purposes. I recently brought up what I have been seeing happening here to my teacher in Japan, Dr. Hisao Ishigaki. He responded in Japanese saying, “it’s really a shame this is happening, as some people will not know what a tenkara rod really is”. Dr. Ishigaki is the leading authority on tenkara in Japan; he consults on tenkara rod design for the large manufacturer, Shimano, as well as for our rods. Shimano makes rods for all kinds of methods of fishing, but they know better than market an “alternative” to tenkara anglers, and Dr. Ishigaki knows using a different rod will result in a considerably different experience. Chances are, if you have been looking for a tenkara rod recently, you may have visited eBay in hopes of finding a used Tenkara USA rod. You probably have noticed it’s nearly impossible to find one of our rods used on eBay (though occasionally you can find one in our forum marketplace). You may also have noticed several “Tenkara style” rods available for sale there, or in other websites. I hope this post helps clarify a bit what a tenkara rod is made for and why it is designed the way it is. Tenkara rods are designed with the specific goals of being cast all day long without tiring your hand and arm, and casting a line forward with maximum effectiveness (transfer of energy). In Japan, where tenkara originated, there are dozens of types of fishing that use telescopic rods. It is very common for people to approach us with a rod they acquired in Japan a long time ago, with the idea that if it is telescopic it is a tenkara rod. 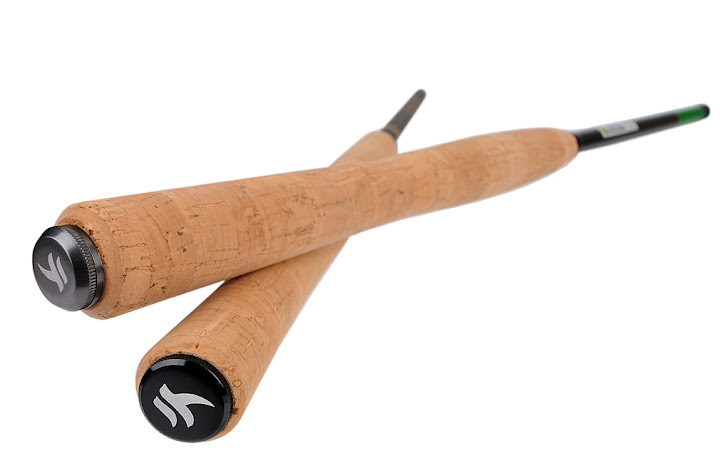 Each rod style, however, is designed specifically with a certain type of fishing in mind. With the first goal in mind – being comfortably cast all day – the main apparent and quickly distinguishable feature of a tenkara rod is the presence of a handle (cork is the more common material used for its thermal properties and right degree of softness). The handle is very necessary for tenkara fishing, not so necessary for other types of fishing in which the goal is to cast the bait once and wait. Tenkara is the only method of fly-fishing in Japan, where the line is cast forward. It is a very active type of fishing. When tenkara fishing, a person will cast the line forward hundreds of times in a day, to pockets in the water. The ergonomic handle is there to provide comfort, prevent the hand from chaffing, and keep the hand from getting fatigued. The right diameter and the right shape of the rod handle will keep the hand from getting fatigued. The right materials will keep the hand from chaffing or sweating. A tenkara-style rod, as pictured above, lacks this essential feature, as it is designed for bait-fishing where the purpose is to cast bait forward once and wait. A second, and less obvious feature to notice, is the casting effectiveness of the rod. More specifically, the dampening of the rod tip after the rod is cast (or shaken). Tenkara rods are designed to cast a very light line forward with maximum effectiveness. A poorly designed tenkara rod, or a rod that was not designed with casting in mind and the rod tip may continue oscillating after the line is cast forward. This oscillation (or wiggling) will make make the line wiggle after being cast instead of shooting straight down to a target. A good tenkara rod, specifically designed with casting the line, will dampen quickly after casting it allowing for the line to straighten. Note: any rod will oscillate after being cast, to improve our rods we design them with the goal of reducing that oscillation, the Ito is a perfect example of a very good dampening effect and I design all our rods with this in mind. Regardless of the rod, to improve casting, at the end of your forward cast relax your wrist to absorb any of that oscillation. Keeping a stiff wrist will make the line wiggle after being cast and likely pile up in front of it. A third feature that makes a tenkara rod a tenkara rod is the length. Tenkara rods range from slightly under 10ft to just about 15ft, with 12ft being the average length. On the shorter end of the spectrum, the tenkara rod will still allow for good reach while staying away from canopy. At around 10ft the rod is still versatile to be used in slightly larger streams, and when necessary choke up the grip position to get into even tighter spots. Much shorter than that, and it becomes a nearly useless tool in larger streams, and it makes it difficult to fish far enough to not spook fish and to keep line off the water. Ideally, in tenkara one will use the longest rod possible for the stream he is fishing. However, with that first goal I mentioned of comfort, we can only make the rods so long before their balance point gets the best out of them. The longest we have been able to make our rods without compromising comfort but allowing for spectacular reach is 14ft 7inches (the Ito). As the first person to introduce tenkara outside of Japan, and who has the explicit goal of introducing the method of tenkara outside of Japan by giving people a good experience with the pure method of tenkara, I will always strive to offer the best possible tenkara rods in the market, anywhere, and to continually improve our tenkara rods. I am personally in charge of rod design and am 100% behind every rod I offer. I have decided from day one that if I were to try introducing tenkara outside of Japan by marketing bad rods, or compromising what tenkara rods are, the experience would be quickly compromised and people wouldn’t give it a second look. If I were to introduce tenkara by offering rods that break easily, not capable of withstanding the rigors of the larger fish found in streams here, then tenkara would never succeed. Instead we continually see examples of our rods testing the limits of what tenkara was intended for (7lb Brown Trout in New Zealand anyone?). If I were to compromise the definition of what a tenkara rod is by offering an alternative in search of an extra buck (more people have asked us for a 7ft tenkara rod than you can imagine, and I guarantee you a 9ft tenkara rod could be our instant best-selling rod as people are used to the idea of a 9ft fly rod – but a 9ft tenkara rod is not the best tool for the method), then we would compromise tenkara and the method would never successfully translate here. Instead, it is successfully catching on because we stayed true to hundreds of years of development in Japan. The market is still in the education phase when it comes to tenkara, and we will continually try providing insights on what makes tenkara, tenkara. » About tenkara, Tenkara industry, Tenkara Rods » What’s a tenkara rod? 23 Responses to What’s a tenkara rod? Thank you Larry for the comment. Hopefully this will be helpful for people to understand tenkara. This post should be mandatory reading for anyone interested in tenkara. I’m going to use it as ammunition the next time someone refers to tenkara as “cane pole fishing” or says they can use a cheap telescopic crappie rod from Walmart for tenkara. Thank you! It is a bit of a shame to put so much work into designing rods for tenkara just to have some people put them into the same category as the crappie rods. Daniel, I can imagine how that would be frustrating. The thing is, to most people, they look the same and if they look the same, they “must be the same”. But if people could compare them side by side, they’d see the difference. Like you said, tenkara is still new to the U.S. and a lot more education is needed. But I think people will eventually get it. Jason, I really appreciate you helping out on the education about tenkara. Btw, got something for you, on the way tomorrow. This is a wonderfully educating post, Daniel. Thank you again for taking the time to educated us regarding tenkara. Tom, thank you for reading it. To be honest, one of your recent blog posts inspired me to do this one. Keep up the great work on your blog! I have it book-marked on Pulse, on my ipad and iphone. Great post, Daniel. I hope it gets a wide audience. Please see my comments under “members only” on the TenkaraUsa blog site (ps-some of our members are some of the very “culprits” i had in mind! Beware of wolves in sheeps clothing!! Daniel, The quality of your product will perservere all the talk and confusion about crappie rods and carp rods. I have met some fly fishing friends who are skeptical about fishing Tenkara when we fish waters with trophy sized fish. I am still learning the capabilities of my Iwana and Awana rods. I am amazed each week with the strength of these rods. And I am talking to alot of fishing professionals about how Tenkara can make fishing more fun. I have shown my rods to most of the guides on the Truckee River and some of them get it. We will continue to explore the abilties of these most able fishing tools. Mike, thanks for the comment and for spreading the word on tenkara and trusting our rods with your fishing! Great post Daniel, I even found myself learning from it. It is unfortunate when a closed minded few poo poo on another countries tradition all in the name of making a buck or worse yet just to discredit something new. I consider myself a traditional tenkara fisher and am very much grateful to you for having the foresight to share this amazing style of fishing with the rest of the world. I’m truly looking forward to meeting and learning from you and the masters from Japan at the summit. Thank you Brian for embracing tenkara for what it is! Looking forward to meeting you in July! I edited that recent post so that readers would not be confused by the rod that I was using. I tried to point out that it is not a tenkara rod. I hope you agree. Thank you Tom! Really appreciate the help. Thank you for the reassuring words! We will always try our best to stay on top of it all. I will be purchasing one of the rods to add to my collection in the near future. I must say though after doing a huge amount of research on the subject of Tenkara I find this post very humorous. The rods have good reviews which is one reason I will be trying one out. But somehow the word pure ascribed to them does not quite fit. Made in China using Japanese materials and labeled USA Tenkara. A bit pretentious no? Anyway look forward to playing with one of these rods in the near future. Thank you but please don’t take yourself to serious it’s a fishing rod and if you want to get all purist than get a bamboo pole like the original Tenkara fisher folk use horse hair line and fuzz off of fiddleheads for fly tying than we can talk pure. No offense but I am after truth not hyperbole. I appreciate the thought and effort of this post. As a consumer, I certainly want the best product for its intended use at the least cost. Valuer is all important, and sacrificed if someone sells me a rod not designed for the use I intend with misleading advertising. That said, how are we, the consumers, to know what rods are Ryukyu tenkara, and what are merely telescoping rods being foisted upon us as tenkara? Certainly there are the obvious cases. But a you are aware each week it seems a new tenkara rod manufacturer enters the market. (Total exaggeration, but you get my point.) I don’t mean this disparagingly, but other than taking you at your word, we have no way of knowing where your rod design comes from. And that goes for all tenkara rods yours and others out there. Obviously e could ask buy Japanese and be assured the rod is tenkara, but even then who is to say the rod want designed for another purpose? For example, Loomis used to sell the Metolius trout spey. Ed Ward has told me that the rod blank was originally designed for surf casting before someone figured out it could be a terrific little spey. My point to all of this is twofold: First, in the absence of some Japanese tenkara society seal of approval there’s no real way to have quality control over these rods. I thank you for the time and effort you put into you rod design and I’m sure your bottom line reflects that. Second, lets be careful not to stand in the way of innovation. Just because something’s not tenkara specific doesn’t mean it can’t get the job done and in fact excel at it. Finally, overall I agree with your point. As for what our rods are, I’d invite you to spends sometime browsing our blog. More than anyone I have devoted myself to learning tenkara under the best tenkara anglers in Japan and I have taken to them our rods for reviewing and feedback. In this blog you will see the experience I have acquired in Japan and also the fact that I design all my rods and work closely with my factories. As for a seal of approval, I believe after 3 1/2 years of offering our designs and still being on the good side of my teachers should speak for itself. Furthermore our rod is now available at a shop frequently visited by the most avid tenkara anglers in Japan too. We have only our word and the fact that I seek to promote tenkara as it is practiced in Japan to stand on. What a gem of information.